Is there a huge difference between centrifugal and centripetal forces? I am doing a video for 8th grade on the subject. I'm showing the experiment of swinging a bucket of water over your head. Is there a huge difference between centrifugal and centripetal forces? Would it be wrong to say the two forces are practically the same thing? In an inertial reference frame, Netwon's laws are sufficient to model (non-relativistic) motion. In a non-inertial reference frame, additional forces (like centrifugal, Coriolis, etc.) must be added to the model. What makes centrifugal different than centripetal is that centripetal force is due to interaction with another object (gravity for orbiting objects, tension for spinning a ball on a string, friction for an object on a spinning merry-go-round, etc), while centrifugal force must be added to the model "out of nowhere", just because you are in a rotating reference frame. To explain this to an 8th grade class, I would give an example of two physicists: 1 standing on the ground, one spinning on a merry-go-round. They both perform measurements to detect the forces acting on the spinning physicist. The physicist on the ground only detects centripetal force, and notes that this causes the other physicist to travel in a circle. The rotating physicist detects centripetal force and an equal but opposite centrifugal force, resulting in him remaining at rest in his frame. There is definitely a huge difference. Centripetal force is a real force that causes objects to move in a circular path or curved path that points to the center of the circle or curvature respectively. Centrifugal force is not a real force. It is an inertial force established so that Newtonian laws are valid when observing motion in an accelerated frame of reference. Centripetal force is the force that an object feels when is in a circular motion. In this picture, $a_c$ is the centripetal force, $v$ tangential velocity, and $\omega$ angular velocity. Now, centrifugal force is the imaginary force that appears when the reference frame is in rotation. For a 3-minute video I think I would avoid both concepts. Centrifugal force can be a confusing concept for several reasons (not least of which that the mere mention of the term tends to attract pedantic know-it-alls who have decided it's their task in life to derail every discussion with loud patronizing explanations of how it doesn't exist at all). Since you don't have any particular reason to look at things from a rotating frame here -- it's not appreciably easier for this problem because in your rotating frame you have to take into account that the direction of gravity changes, and the bucket isn't even following a uniform circular motion; and there isn't any observer in the bucket whose experiences we need to explain -- there's no reason to step into the quagmire of centrifugal force. Centripetal force would also seem to overcomplicate the situation here. Again, since the circular motion is not uniform (it's slower at the top due to gravity) you'd need to get into instantaneous angular velocities and other hairy stuff to justify its use properly. Unless you need to calculate the force with which the bucket pulls you upwards at the top of the swing, that's not really worth the trouble either. The water wants to fall down, but not at any cost. In particular it doesn't want to fall down faster than with an acceleration of 9.82 m/s². When you're pulling on the bucket in order to keep it going in a circle, you're forcing the water to move downwards faster than it would if it was falling by itself. It resists that motion (which you can feel in your arm), and doesn't move down any quicker than the bucket is forcing it to. Centripetal and centrifugal forces are only equal for an object being held stably in a rotating system. A good analogy is the difference between 1) the force of gravity and 2) the supporting force of the ground pushing up on you. Centrifugal forces and gravity aren't quite proper forces since they are really more like fixed accelerations; to represent them as a forces we need to multiply by the mass of the object. The force of the ground pushing up on you, which counteracts gravity, is a very real force having to do with your feet's surface molecules straining against the ground's surface molecules. Likewise the centripetal forces for water in a spinning bucket, are real contact forces that support the water inside the bucket. But for an object falling, there is no supporting force yet the gravitational force continues pulling downward, according to an observer standing on the ground. Likewise for a drop of water that falls out of the spinning bucket, there is a centrifugal force that pushes the drop away, according to an observer rotating with the bucket. A totally fictitious example: Consider a distant object that is at rest in an inertial frame. 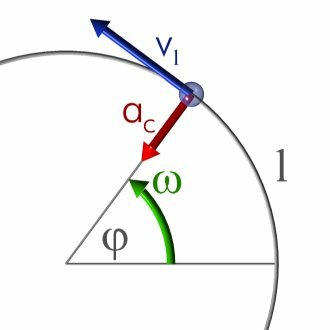 In that frame you rotate at some uniform angular velocity. In your non-inertial rest frame, the object is rotating at the opposite angular velocity, it thus has a centripetal acceleration toward you. How then do we account for the fictitious centripetal force acting on the object? There is a centrifugal force due to using a non-inertial frame, but this force acts in the opposite direction, it is directed radially outward. However, there is another fictitious force acting on the object, the Coriolis force which has twice the magnitude of the centrifugal force and this is directed radially inwards (in this particular case). So, in this case, the fictitious centripetal force is the sum of the centrifugal and the Coriolis force. It is wrong to say they are the same. I suspect for a short video that it would be better to choose one which is most relevant for your purpose and not mention the other. Centripetal force is any force pulling inwards on an object to maintain its motion in a circle - in your case the force of your arm pulling on the bucket as it swings. A fictional force that exits in a rotating reference frame, along with coriolis force. In your case 1. is the force of the bucket pulling on your arm. I would only introduce 2. in a video if you film or animate a sequence with the camera rotating to match the movement of the bucket. In that sequence the bucket would be stationary and centrifugal force would pull it away from you. When you're whirling a bucket of water, centripetal force is carried by your arm, the rope, and the bucket. It points inward toward your shoulder, which is the center of the circle formed by the whirling bucket. Centrifugal force is caused by the inertia of the water in the bucket. Inertia is the water's momentum to continue in a straight line at a right angle to your arm and the rope, tangential to the circle formed by the whirling bucket. Centrifugal force is not really a force - it's the apparent force that draws the water in the bucket away from your shoulder. Not the answer you're looking for? Browse other questions tagged centripetal-force centrifugal-force or ask your own question. How does centrifugal force work? Why is the eye of a cyclone a forced vortex? Do centripetal and reactive centrifugal forces cancel each other out? Is there a difference between normal forces and centripetal forces?